Home / Events / Football Lads Alliance / Manchester / News / Robinson / Oppose The Football Thugs Alliance in Manchester on Saturday ! Oppose The Football Thugs Alliance in Manchester on Saturday ! A coalition of Manchester people is supporting a statement opposing a protest by a far right group in the City on Saturday 19th May. 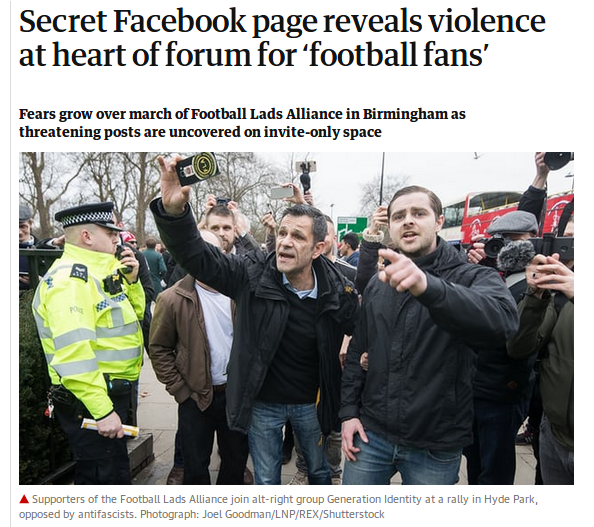 Football 'Lads' Alliance has been exposed, most recently by the Guardian, as being nothing but just another street gang of thugs. An English Defence League, Mark 2, if you like. Despite falling out with most other Far Right Groups, having their leader quit, questions over lots of missing cash, threats and accusations from them of 'scabs' and 'traitors' to most of their fellow thugs, it seems Manchester will happen. Here's the official statement put out by the Opposing Group. Stand Up to Racism’s statement against the FLA coming to Manchester is supported by 16 MPs, 2 MEPs, Manchester City Council Leader Richard Leese, over 30 Manchester Councillors, Regional Trades Unions, and others, including Dan Hett, brother of a Manchester attack victim and co-founder of Survivors Against Terror. The MPs supporting the statement against the FLA are: Debbie Abrahams MP, Yvonne Fovargue MP, James Frith MP, Kate Green MP, Andrew Gwynne MP, Mike Kane MP, Barbara Keeley MP, Afzal Khan MP, John McDonnell MP & Shadow Chancellor, Liz McInnes MP, Jim McMahon MP, Jo Platt MP, Yasmin Qureshi MP, Angela Rayner MP, Jonathan Reynolds MP, Jeff Smith MP. 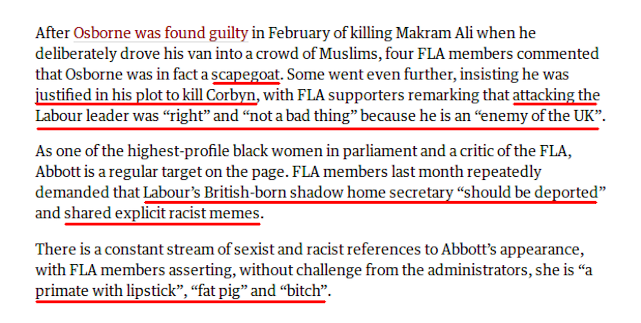 The Football Association recently wrote to Premier League Clubs warning them about the FLA.
‘Far from opposing extremism, the FLA's closed Facebook page continually sees racist and Islamophobic posts’. Stand Up to Racism & Unite Against Fascism are holding a mobilisation in opposition to the FLA, and will be meeting at 11.00am on 19th May in St Peter's Square, Manchester. Poet Tony Walsh, who will read his poem ‘This is the Place’ at the Vigil following last year’s attack on the Arena, is also supporting the statement against the FLA.
Other signatories opposing the FLA include: Julie Ward MEP, Wajid Khan MEP; GMB North West & Irish Region, PCS North West Region; UCU North West Region; UNISON North West Region; Show Racism the Red Card; DJ/Writer Dave Haslam; Regional Trades Unionists from the CWU, FBU, NUT-NEU, RMT, Unite; and many others.